The Le Mans series is the oldest and most respected endurance driving series in sports car history. When people debate some of the great cars in the race’s prestigious history, there are a few that rise to the top almost immediately. But for many, the car that tops that list is the McLaren. It was a legendary showing for the McLaren, the type that had spectators drooling and dreaming about the car’s performance for years, debating about its place in history. Spectators, of course, have only been further tantalized in the years since due to the McLaren’s absence from the event. After competing in 1995, the McLaren only took part in the race for a couple of more years, until 1998. What would have happened if the McLaren had stuck around? Well, now 16 years since their sudden withdrawal, the McLaren is amping up for another run at the Le Mans title. The car was officially debuted just two weeks ago at the Goodwood Festival of Speed and will retail for about $564,000. WOW. Like its predecessor (the four-year-old MP4-12C racer), the new McLaren features a carbon monocoque, as well as a 3.8 liter twin-turbo engine. 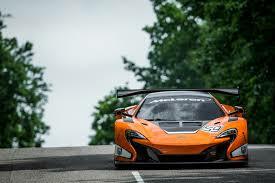 This entry was posted in Culture, Racing News and tagged 1998, GT3, GTE, le mans, mclaren. Bookmark the permalink.